Party never stops in Morrison’s 2. Do you think that Sunday or Monday is not about parties? All the uni students and visiting foreigners maintaining the party mood for you to have fun on every day you want to, even if it’ a Sunday. The basement level is a labirynth of ballrooms with a big variety of genres –electronic, pop, r&b, hip-hop and retro, just to name a few. 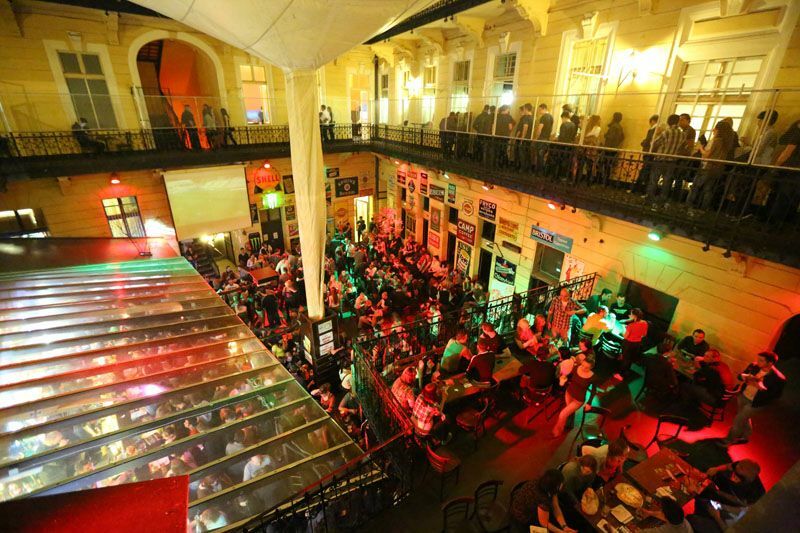 10 individual bars on all 3 levels, a courtyard suitable for all seasons, and 6 huge ballrooms guarantee the neverending night. If you feel the urge to impress the audience, look for the karaoke room and go for it! There are also table football and pool tables if you feel like you’re better at sports, but if you want to get some booze involved, Morrison’s 2 is famous of the legendary beerpong tournaments as well! It’d be hard to count how many different kind of parties you can choose in a month, from latin parties to uni nights or electronic music gatherings. One thing’s for sure, no one’s gonna get bored here! Entry is free until 9PM, and you should check out the discounts online, as there’s always something new! If you feel like, you can invest in a booze party pack with your friends in advance, so you can save some backup money for later.